The Commonwealth of Massachusetts’ HomeBASE program provides flexible housing assistance to eligible homeless families, along with stabilization services to support those families once they secure housing. Housing Solutions administers HomeBASE in Plymouth and Bristol counties but eligibility for it is determined by the state at any one of its Department of Transitional Assistance (DTA) offices. If your family is eligible, the exact nature and amount of HomeBASE assistance is determined on a case-by-case basis. Since the program’s inception in 2011, Housing Solutions with our community partners – Catholic Social Services, JRI, Quincy Community Action Program, and Fr. Bill’s & MainSpring – have housed approximately 4,000 families through HomeBASE. We and our partners continue to work with homeless families in shelters, motels and those newly determined eligible to secure housing with the goal of substantially reducing the number of homeless families in our region. Families who we assist through HomeBASE are then eligible for assistance to increase their income through one of two Secure Jobs programs with which Housing Solutions collaborates. These programs have already placed over 400 HomeBASE participants into jobs by providing job training, coaching and placement services. SER Jobs for Progress in Fall River runs the Secure Jobs in Bristol County and Fr. Bill’s & MainSpring does so for Plymouth County. Michael Moog had worked steadily for 20 years and never thought he’d need help from any government agency. But suddenly in 2012 he found himself a single parent and had to leave work to care for his 3-year-old son Shawn. Soon after, they were homeless. So, Michael walked into the Brockton DTA with Shawn and asked for help. The two were placed in a local motel. 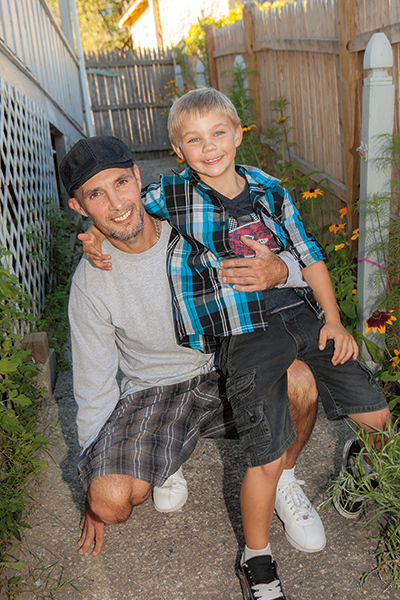 Michael took advantage of all the “tools” that HomeBASE offered, such as child care support and financial literacy training that helped him put his and his son’s lives back in place. Michael has transitioned off of HomeBASE. He has a full-time job installing fire sprinklers, and he just landed a promotion. His life has also been blessed by the addition of his girlfriend, Lynda, who has brought joy, love and increased stability into Michael and Shawn’s lives.